Looking for a chewy, crunchy, flavorful, on-the-go snack? 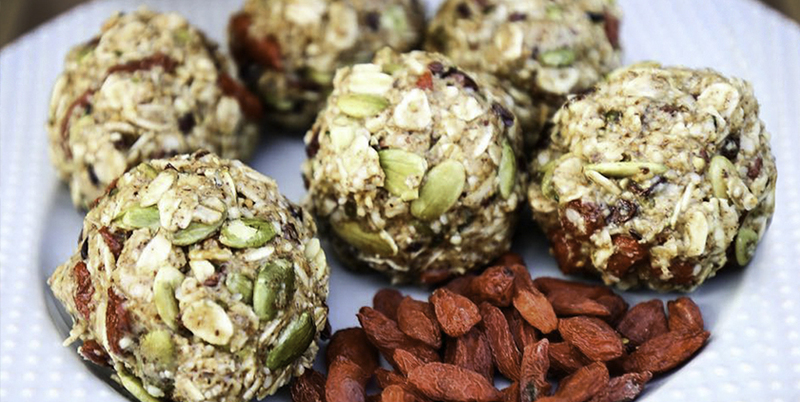 This pumpkin protein energy balls recipe is delicious! While we’ve broken out the ingredients for you below, there’s no “right or wrong” way to make protein energy balls. You don’t have to use a set recipe every time. Even try throwing the ingredients you have in stock together until you get the consistency and taste where you want it. You can add different items based on your tastes, the season, the occasion, etc. This recipe is quick, simple and produces a nutritious snack you can easily grab and go. Adjust the amount of each ingredient to suit your personal preference. Place each ball onto the lined cookie tray.